Fairfield is slowly struggling back to normalcy, officials said Sunday, after being walloped by a blizzard two days earlier that dumped 35 inches of snow on the town in a 24-hour period. First Selectman Michael Tetreau said municipal offices will be open Monday on their regular schedules. The Department of Public Works, he said, has indicated it will be able to have parking lots for town offices cleared and Tetreau said this will enable the town to staff its call center, much like it did during Superstorm Sandy. The road clearing, however, is going slower than anticipated, officials said, because of the large amount of snow. In order to clear streets, payloaders need to be used. The goal is to make one pass and get one lane clear on every road, though it may take until the end of Monday for that goal to be achieved. Some residents, however, have not been showing much patience with the progress being made by DPW crews, who have been on the job since snow start falling Friday morning. The phone was ringing at 7 a.m. at the public works garage Sunday, and those calls have continued non-stop. By the afternoon, employees had fielded well over 300 calls. "I think our DPW has done a tremendous job," said Police Chief Gary MacNamara. MacNamara said there have been no fatalities in town attributable to the snow storm, and after a flurry of accidents during the day Friday, the call volume has been low, the chief said. As people venture out in their cars, MacNamara urged them to be cautious, particularly at intersections where sight lines are obscured by large piles of snow. "At every intersection, it can be an extreme hazard," he said. "It's very difficult to see coming out of the side streets and drivers should be very cautious." MacNamara also said motorists should also be aware that there is a large number of pedestrians out and about. He said some cars abandoned by owners have been towed to allow street clearing to by town crews to proceed. MacNamara noted that Fairfield does not have regulations that restrict parking during emergencies, but that subject is on the agenda for Wednesday's Police Commission meeting. It had been set for discussion agenda prior to the storm, he added. MacNamara said town officials, including the first selectman, Fire Chief Richard Felner and DPW Superintendent Scott Bartlett will meet again at 10 a.m. Monday to assess the progress of the cleanup. In the immediate aftermath of the storm on Saturday, Bartlett had described himself as "disgusted." Not with his crews, who had been working round-the-clock since it started snowing Friday morning, and not with the department's equipment. It was Mother Nature who was the target of his wrath. "Mother Nature is really being cruel lately," Bartlett said, after more than 2 feet of snow was dumped on town by the overnight blizzard. Bartlett and Deputy Fire Chief Art Reid both told the Fairfield Citizen that snow plows and emergency vehicles found themselves stuck in the wind-driven snow at the peak of the storm. The town appeared to have weathered the storm without any major emergencies, however. Perhaps most surprisingly, there were no power outages in town reported by United Illuminating early Saturday. Reid also reported that fears of significant flooding during Friday night's late high tide did not materialize. Now, the town's focus turns to digging out and Reid reminded residents that it will take several days to get roads clear, or in some cases, scarcely passable. Bartlett's highway crews have been on the job since 7 a.m. Friday, and are using 12 payloaders to pick up the snow. "We've got about 50 percent of the main roads cleared, an who hope to have the rest done by about 11 a.m.," Bartlett said. After that, attention will turn to secondary roads and then to the cul-de-sacs in town. On Sunday, Bartlett said, crews were to begin to truck the snow that they've been piling up down to the parking lot at Jennings Beach just to get the massive amounts out of the way. He said numerous cars were abandoned on streets after they became stuck Friday night, and officials are putting together a strategy to tow them as soon as possible. "I've never seen this much snow in one event," Bartlett told the Fairfield Citizen. "This is a solid 2 feet in one drop. 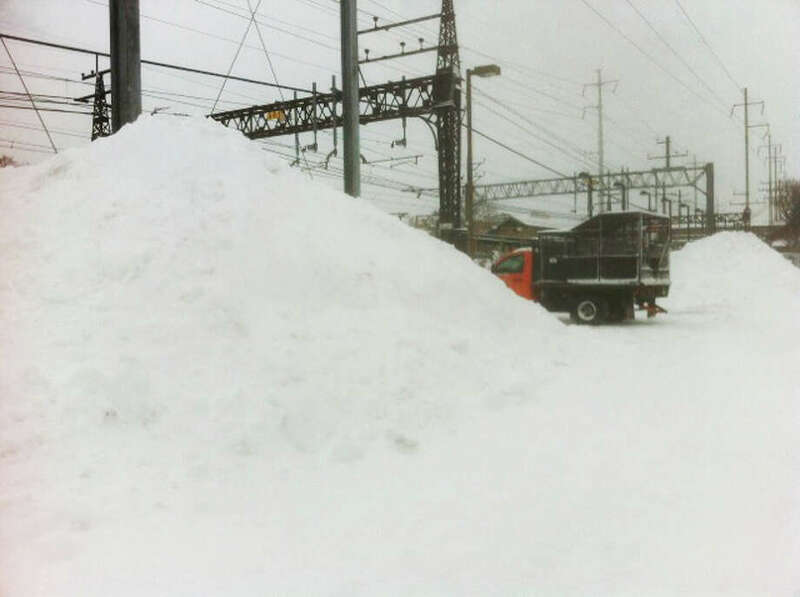 It's a lot of snow." Police and firefighters are being held over their usual work shifts, Reid said, because those who were on duty during the storm can't get home, and those who are home can't get to work. As of 8:30 a.m. Saturday, Tetreau had estimated that "50 percent of our main roads are clear. We are projecting to have the rest of the main roads cleared later today. The next priority will be side streets. We have 380 cul de sacs that will not be cleared until Sunday." He also asked residents who live near fire hydrants to dig them out of the snow drifts as a fire-precaution measure.